This course is for municipal or county employees and those that work with them who are involved in the planning, inspecting and placing of asphalt pavements. The course will provide the information needed to properly plan and monitor a hot mix asphalt paving project. Basic knowledge of hot mix asphalt materials and example construction specifications will be provided. The importance of proper roadway preparation to obtain a long lasting product will be discussed. A basic understanding of the design, delivery, placement, and compaction process in paving operations will be provided. 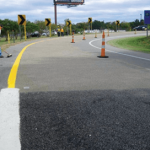 Intended Audience: Public Works employees who plan, supervise and inspect Hot Mix Asphalt (HMA) and Stone Matric Asphalt (SMA) rehabilitation projects for local governments.